As we welcomed in the first Shabbat of second month, we to ok a step back after a hectic week of welcoming new campers and whitewater rafting. We ended Friday night with spirited zmirot (songs) and a meaningful tisch. On Saturday afternoon, we had the opportunity to talk to Paula Gris, a Holocaust survivor who shared her moving story about her escape from the war. Her experiences were a powerful introduction to Tisha B’Av (the day commemorating the destruction of the 1st and 2nd Temples in Jerusalem). After watching a beautiful tekes (ceremony) and listening to Eicha (the Book of Lamentations, read every Tisha B’Av), many began their fasts. Tisha B’Av was filled with spiritual reflection and pensive time. Throughout the day, we prayed, learned about the Holocaust, and discussed the current situation in Israel. 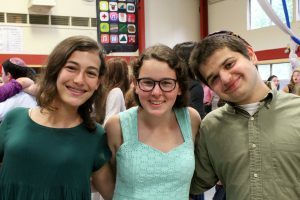 After watching the movie Defiance, a film about a family and group of Jews who escaped the horrors of WWII by hiding in the woods, Tisha B’Av ended with a heart-warming ceremony and a delicious break fast meal. We spent the rest of the night preparing for the long awaited yom Yisrael (Israel day). Yom Yisrael was a success and the campers were excited to spend their mock shekalim (Israeli currency) in our shuk (market). 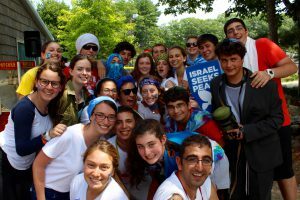 Whether selling avateeach (watermelon), sucaryiot (candy), popcorn, or yerakot (vegetables), we had an incredible time getting the campers excited about Israeli culture. Some of us dressed as chayalim (soldiers), tayarim (tourists) or Charedi women- regardless of what we dressed as, we all came together to plan an awesome shuk for the rest of camp! !